Now that we are back home, we are diving back into house projects and this makes me so happy! We only have a tiny portion (of the huge) porch to sand before we can prime it and get my dream southern blue floor painted! 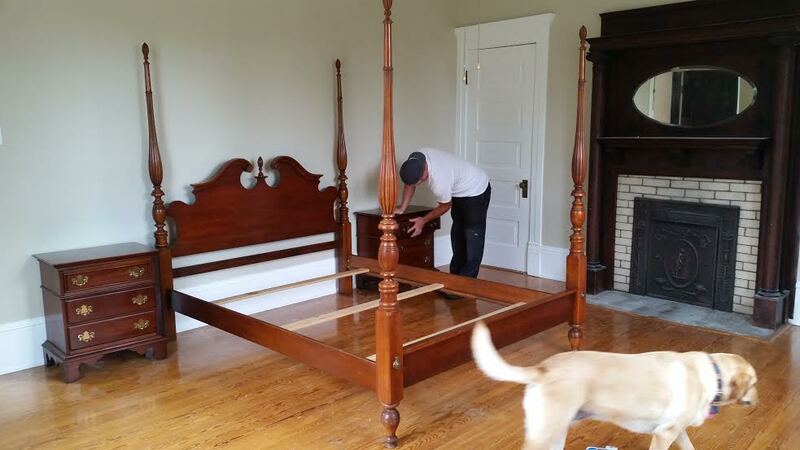 We also scored a gorgeous antique bedroom set from a local yardsale site for another guestroom - all we need is the mattress/box spring combo and of course some pretty bedding. 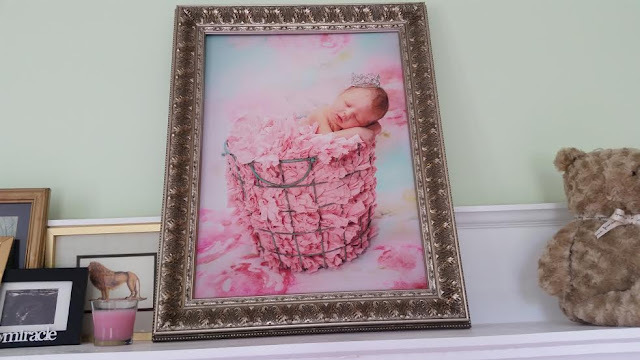 Our photographer called and let us know that Miss A's portrait was done and I am SO in love with that pretty addition to her nursery. (Don't mind the stuff on the mantle and we haven't hung it yet!) I've been staying busy with lots of bridal showers coming up, a wedding planning meeting and consultation next week and also was asked to judge the new Longwood University Cheerleading squad again this year! Woot woot calendar is full! There is so much good stuff going on in the lives of my closest friends and I cannot wait to share! I feel so blessed lately and thankful for everything God has given us. I feel like we are all right where we need to be! Oh, and want to know what happened last night? (Mama's don't smack me!) Andi slept for 10 hours ya'll! She always gives us 6-7 but 10?! 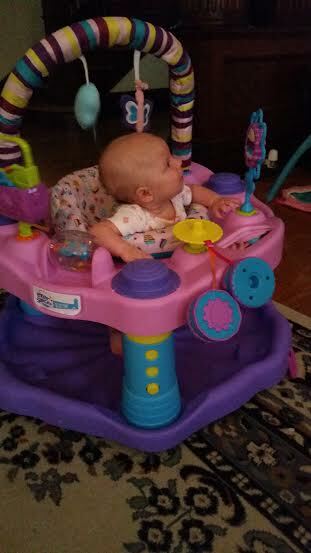 You go little lady - we are seriously some spoiled parents. She is also getting so strong (so bittersweet because of course as Mom's we want them to progress but secretly I want her to stay little haha) If you have me on snapchat (jessicamc313) then you saw the excersaucer I put together for her and she is loving it for a few minutes on and off during the day. She's not quite tall enough so she gets a little frustrated sometimes...it's too cute though! Alright, we are heading to see some family and my sis out of town today so we have to take off - I hope everyone has a great day and guess what? Tomorrow is FRIDAY! That portrait is ADORABLE! Such a sweet little girl! And so jealous of your deck, I am dreaming of a huge deck with patio furniture, etc. in our future "dream home"! Your deck is going to be so fabulous!!! If you need some to come over and break it in with ya, just let me know :) Glad everything is going well and that you're so happy! Yay for sanding! haha The porch is going to look wonderful. What a deal on the bedroom suite! Can't wait to see how it comes together! I can't wait to see how your porch turns out! That's awesome you scored that nice of a bed set at a garage sale! Your house is ridiculous! I am obsessed with it! Can't wait to see how the porch turns out! And I can't believe Andi slept for 10 hours! Woah! What a great find in that bed set!! & Andi's portrait is so cute!! 10 hours?!?! We need you secret asap. I'm super excited when we get 4 hours, but 10 sounds like a dream come true. Love the frame picture of the babe. You are such a talented home owner and home updater. I love your status reports, you have such an eye for style. WOOHOO Longwood CHEER! I had so many friends that were on the cheer squad and when I worked with the basketball team I pretty much learned every cheer, haha. [Move that ball on down the court, yell HUSTLE, hustle]! Don't you just love working on your house, my husband and I are completely renovating ours. Y'all are doing such an awesome job! yay for 10 hours! not even i get that much sleep ;) can't wait to see the finished porch! That antique bedroom set is beautiful! And yay for sleep! Finn does 10-12 hours every night!!! But I will warn you of the 4 month sleep regression. It is a very real thing, and very devastating. Hopefully Andi doesn't fall victim! 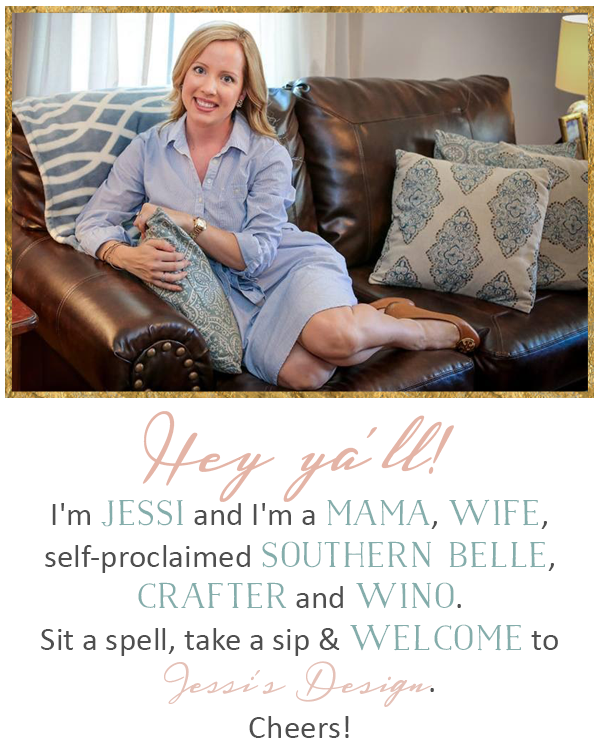 Get it girrrrrrl with the home updates! 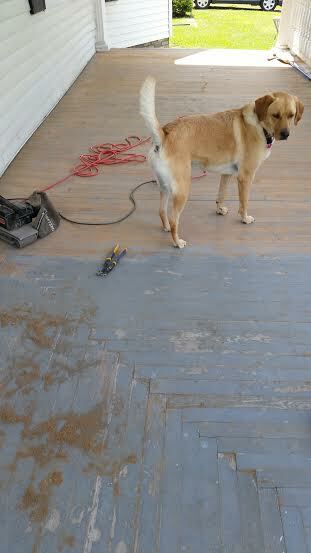 You guys are always plugging away at the home improvements--can't wait to see the finished product! Don't mind me, just catching up. :) Glad life is going well for you, friend!